Wow, what a fantastic photo. Love the colours. This is such a stunning view, Artur! Congrats on the 5th!!! Such wonderful/unusual light, and you've captured it well. Thanks for voting and the comments. The picture was processed from one exposure, it was tone mapped in Photomatix, but I wouldn't say that it was done with HDR technique. The blue sky cast on the left is how it was at the moment of taking the picture, and it looks the same way on the original. I have to admit that Scotland is a beautiful place, and very photogenic IMO, a highly recommended spot for a photographic adventure. Amazing scene, fit into the frame perfectly, looks great with HDR too. I've been here and shot this landmark from many perspectives. 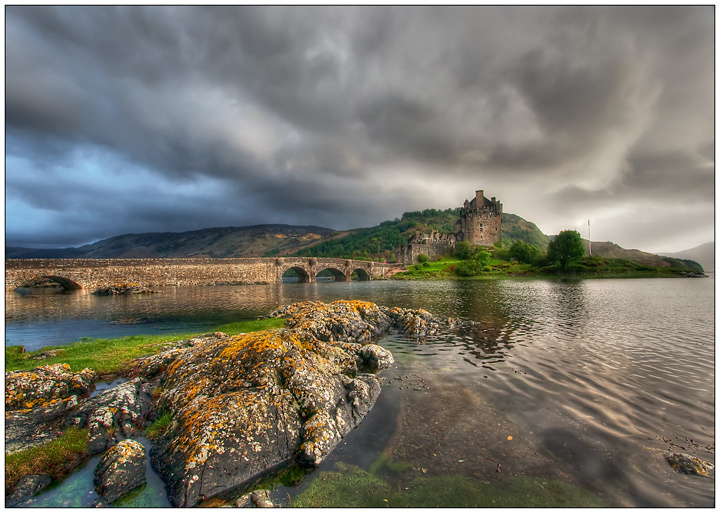 But your photo is about the best I've seen of Eilean Donan. Thanks for the great photo ... and for the nostalgia trip. WOW - What a beautiful landscape shot you have captured here. Good luck for the challenge. Gorgeous view - really nice use of the foreground elements. I absolutely love the soft feel of this shot! It's so perfect. I wish the top of the castle was a little brighter to fit with the front side of it, but that's minimal. The water looks very good! What a nice peaceful scene, beautiful colors, nice DOF, really well done. Very nice view point. The sky makes the picture more dramatic. Nicely composed with good foreground interest. The blue area on the left side of the sky is a little bit weird for me, especially as it seems to be extending over the hill area. Proudly hosted by Sargasso Networks. Current Server Time: 04/23/2019 04:02:22 PM EDT.